The Principal Support Framework represents the best thinking of educators from across the country about the support needed to advance principal leadership focused on improving teaching and learning at scale. A Shared Vision of Principals as Instructional Leaders. A System of Support for Developing Principals as Instructional Leaders. Making It Possible for Principals to Be Instructional Leaders. 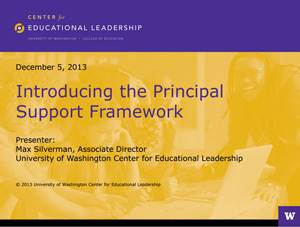 In this webinar, CEL Associate Director Max Silverman provides an introduction to the Principal Support Framework and to the steps districts can take to support the development of principals as instructional leaders. Who should view the webinar? 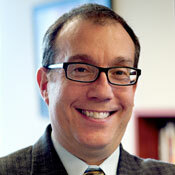 Max Silverman, as a CEL associate director, provides leadership for CEL's district partnership work. He joined the Center in 2009, after leading high school reform efforts in the Highline Public Schools for the previous nine years. As a principal and central office leader, he successfully led the transformation to a portfolio of high schools focused on sustainable instructional improvement and personalization. His central office experience was focused on instructional leadership for ten high schools, particularly in the areas of literacy and math.